In this article we'll take a look at how a polarizing filter can improve a number of photographic scenes, along with a few unexpected results it can have. While these filters will darken images by about one stop, the effect rendered in ideal conditions is dramatic. Costing anywhere from $30 to $200 the filters are, in my opinion, more effective at producing sharp contrast between clouds and sky, or removing reflection from water and glass, than the time spent in post-production software. In practice, circular polarizing filters are easy to use. They are available in a wide variety of diameters to fit most any modern lens and screw onto the thread at the end. Polarizing filters work by only allowing a certain angle of light to pass through. The intricate science behind how filters actually work is well described on this Colorado University website. In simple terms, a circular polarizing filter is rotated so certain wavelengths of light are blocked from entering the lens and hitting the sensor. This can be fine turned depending on the angle between your light source (the sun or light bulbs, typically) and the subject being photographed by spinning the filter until the desired effect is accomplished. While a polarizing filter (hereafter referred to as a polarizer) is no panacea for completely removing reflections from glass, it can do an amazing job at reducing the prominence of unwanted object. Take for instance the two shots below. The fist is shot with the polarizer 'open'. As I mentioned before, a circular polarizer is rotated in an either clockwise or counterclockwise direction to adjust the amount of filtering. When I speak of the filter being open, I mean it is set to allow the scene before it to pass through practically unchanged. Now, take a look at what happens when I turn the polarizer to allow for maximum blocking of reflected light. The light from the windows behind me is all but gone (there is still some faint evidence from a few windows) and the color cast from the fluorescent lights has been removed. While the subject matter of the photograph may not be compelling to most, we have gone from a practically non-useable photo to one with opening possibilities. Beyond the glass reflections do you notice anything else going on between the images? We'll take a look at these other changes in a minute, but in the mean time I'd like to point out the increased contrast in the clouds and much reduced contrast in the waves. These next two shots, shot on the same gray, rainy day as the previous pictures, show how a polarizer can improve landscapes in even the worst of weather. In this case, the rain had not yet reached my location but was pouring over the distant island. The first picture again shows detail in the waves and a nearly featureless cloud bank. The rain is visible over the island and obscures much detail on the distant coastline. If you could see the sun, it would be approximately 90 degrees to the left of the shot and low on the horizon. Now the same shot with the polarizer fully engaged. What do you notice first? The clouds have taken shape and various shades of gray are more clearly visible. While some rain is still visible, the glare has been cut and the shoreline comes through more clearly. But the water has gone flat again. Why is it that when the clouds come through with more definition from use of a polarizer, the seas lose definition? To understand this phenomena a bit better, consider what a large body of water looks like from near sea level on a sunny day. I can speak from my own experience that the water in this shot is a number of wonderful shades of blue when the sun is out. This is because water reflects a lot of light and will take on the colors of those reflections. On this gray day the water gets much of its definition from the gray in the clouds. When this reflection is removed by the polarizer, the definition provided by the clouds' colors disappears as well. Ok, now that we've seen what a polarizer can do in bad weather, it's time to see what happens when the sun starts to shine. A polarizer can do it's best work when the lens is pointed 90 degrees away from the light source. In all of these next examples the light source is the sun. The easiest trick to finding that sweet spot is to make the letter L with one hand and point your thumb at the sun. Then look to where your pointer finger points, rotating your wrist as needed. This is where a polarizer will have maximum impact. This is not to say all photos taken with a polarizer need to face this direction. Often your subject matter will not be in this optimal path. It's more of a rule of thumb (pardon the pun) for finding the sweet spot. The example below is shot at 90 degrees to the sun with the polarizer wide open on a 16mm lens. You may notice the vignette in the corners. This can happen with using a polarizer on an Ultra Wide Angle (UWA) lens. If this happens with your camera it can be solved by using a filter larger than the diameter of your lens and then attaching it with an adapter. If you shoot a lot of wide landscapes with a polarizer, it's worth it. I have left the vignette in for these pictures so you may get a realistic look at what happens at wide angles. The sky is a soft blue, transitioning nicely from the horizon to the top of the frame and the clouds are soft against that sky. Some of the blue is shown reflected in the water. This shot was taken at ISO 50, 1/200 and f/7.1. In the second shot take a look at how much bolder the clouds are against the sky. The sky has also lost a fair amount of the soft blues, especially higher up. The water has also lost a lot of it's blue tint, being replaced with white from the clouds. And this has, interestingly enough, brightened up the shadowed side of the ferry boat. Cloud definition is again enhanced. This image was shot at ISO 50, 1/160 and f/6.3 in Program mode, showing that the camera will compensate for the reduced light entering the lens. I want to show the histograms from the last two images in the order they appeared. The first image shows each color with a clearly independent line on the graph (as is normal). The histogram from the polarised shot shows a much more refined representation, as scattered light is eliminated from entering the lens. The horizon is aglow in sunset colors as the sun has just about set behind the Olympic Mountains off camera to the left. Mount Rainier can be seen towering above Seattle. The clouds are soft. Now, take a look at what happens when the polarizer is engaged. The oranges drop off as the light gets further away from its source from the right and only a faint band can be seen. The clouds have what is now becoming a familiar punch as they pull away from the sky behind them. As with the coast line earlier, removing that haze brings about more detail hidden behind it. Also notice the dramatic shift in the water. I hope this article has given you an idea of what can be accomplished with a circular polarizing filter. Experimentation is half the fun of photography (especially with the unlimited capacity of digital photography) and a polarizing filter is an excellent reason to get out and see how different things can look with a new eye. While they are great at cutting through haze and sharpening clouds, they can bring unexpected results to surfaces you may not have even realised were reflecting so much light! 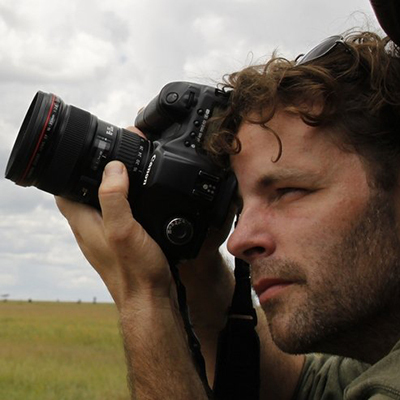 Peter West Carey is a world traveling photographer who enjoys helping others learn the joy of great photography.